Celtic manager Ronny Deila says he views Nadir Ciftci as "a long-term project" after his new signing was substituted for a second successive Champions League qualifier. 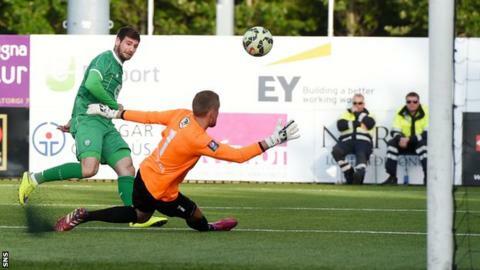 The £1.5m acquisition from Dundee United was taken off after 75 minutes of the 2-0 first-leg win over Stjarnan. In Iceland, he was replaced with Leigh Griffiths, who scored in a 4-1 victory. "This is not a project for three weeks," Deila told BBC Scotland. "This is a project over months." Ciftci's progress will not be helped by the Turk being banned for the first six games of the domestic season. He was found guilty this week of biting Dundee winger Jim McAlister during a city derby last term. But Deila pointed out that games every week in Champions League qualifying would keep the 23-year-old match sharp. "We have a lot of training," he said. "We will get him fit." The Scottish champions will now face Qarabag in the third qualifying round after the Azerbaijan champions overcame Rudar Pljevlja in Montenegro by the only goal of the tie. The team from Baku, who have won their domestic title for the last two seasons, have a squad of Azerbaijan internationals interlaced with a few Brazilian imports. "It's a totally different game next time," added Deila. "We went through, that's the most important thing, and we meet a better team now in the next round - much better team. "I've seen them play one game and they were better than the Montenegrin team, so it's a good opponent." Deila was not concerned about having to play the first leg, next Wednesday, at home. "You have to take what you get," he said. "If you're going to go to the Champions League, you have to beat the opponents in front of you. It's going to be an interesting game." Deila also shrugged off the concession of an early goal in Iceland, with Stjarnan pulling the aggregate score back to 2-1. "It was a little bit of a difficult start," he said. "It was a tough pitch to play on when it's so dry. "Every artificial pitch should be watered all the time. "We were better in the second half than in the first and we won comfortably in the end."